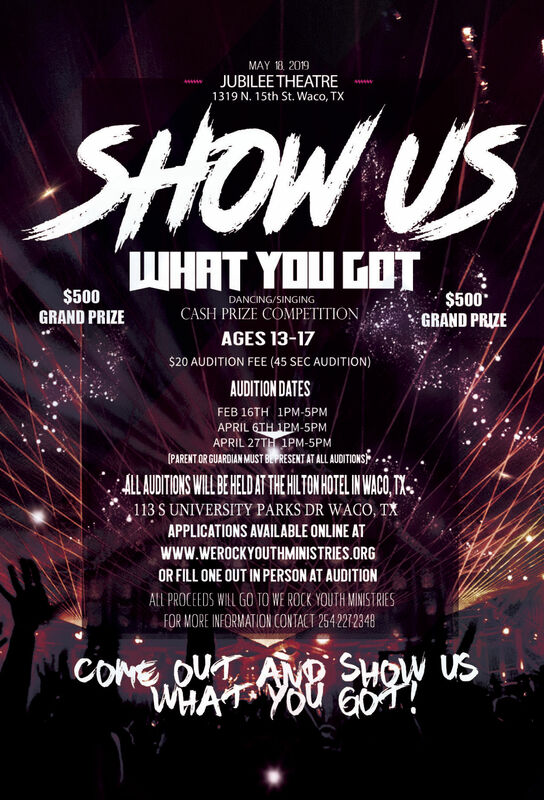 “Show Us What You Got” dancing/singing competition with $500 grand prize, presented by We Rock Youth Ministries, 7 p.m. May 18 at Jubilee Theatre, 1319 N. 15th St.; doors open at 6 p.m.
Auditions, which cost $20 for a 45-second performance, are Feb. 16, April 6 and April 27 from 1 to 5 p.m. at the downtown Waco Hilton, 113 S. University Parks Drive. Parents or guardians must be present. Email werockministries@gmail.com or call 254-227-2348 for more information.